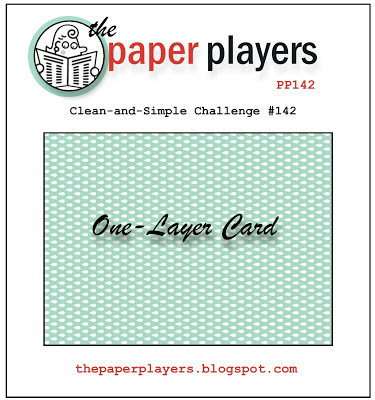 This week the challenge over at The Paper Players is to create a one layer card. Considering I don't like a lot of embellishments you'd think that this would be an easy challenge for me but nope, it sure wasn't! I finally decided on a nice, simple Fathers Day card. I used the truck image from the set Countryside. This set is going to be retiring but that's ok, I'll still use it(if you come by my blog regularly you'll see I use a lot of retired stamps. As a hobby demo I buy sets because I like them and want to use them, for many yrs to come)! To help highlight the truck I scored some lines above and below the image, to create a frame of sorts. Wow, Lisa! This is stunning. This is the first time I've ever liked this image, and I love it! Thanks for playing along with The Paper Players this week. 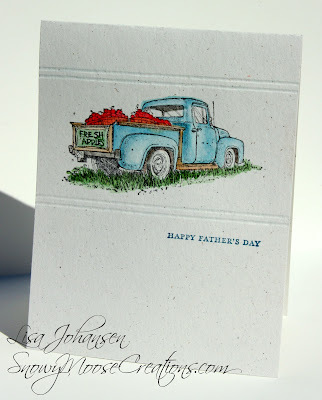 Your one layered card is fantastic, Lisa! I love how the score lines really help highlight the truck image. The truck reminds me of the old truck that my grandpa had. I remember bouncing around in it while going over the narrow dirt roads to check on his fields with him or the pasture with the cows. This is a great card. I may have to purchase this set before it retires. A perfect Father's Day card! Your coloring is beautiful, and the score lines are the perfect touch! Thanks for playing with The Paper Players!